The Alliance française de Bangalore presents “Ici, on parle français !! !” an original comic by Pashupati “Poltu” Chatterji. 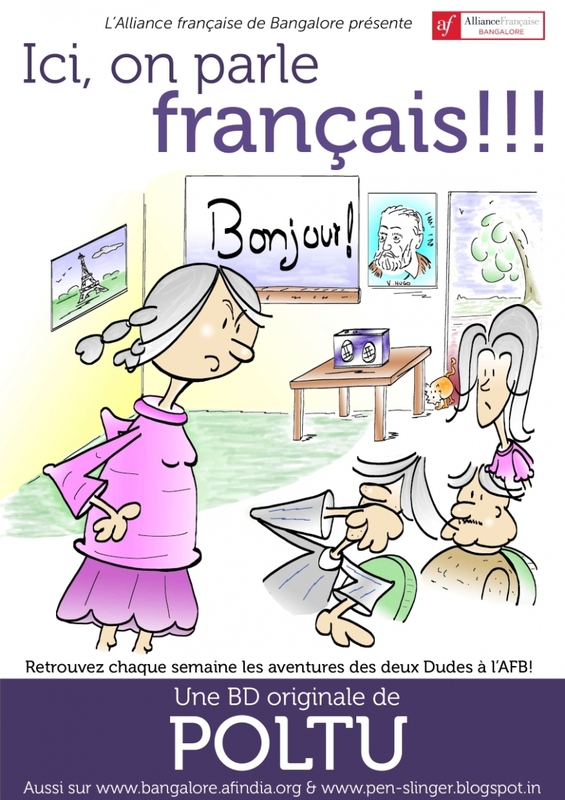 Join the adventures of Vics and Sid, the two dudes at Alliance française de Bangalore, as they learn the french language at AFB. Everyone, who has ever been a student of French, will find themselves in these two characters. Published every Thursday on the website and on Français Mathadona. Pashupati “Poltu” Chatterji is a humor novelist, cartoonist and songwriter. “Poltu” is his pen-name. Poltu describes himself as an overgrown teenager and an incurable Wodehouse addict. He spent the early part of his childhood in Africa, and later in Rajasthan, India. He also lived some years in Germany. He is currently based in Bangalore, India. Before turning a full time novelist in 2006, Poltu worked in software. He speaks English, German, French, Hindi, Bengali and smatterings of Kannada, Marathi and Swahili. Poltu draws two weekly comic strips on his humor blog pen-slinger.blogspot.com in English and French (Good God! and Blandine’s Farm). He has also written a series of comedy novels featuring Perl, a woman detective, humor non-fiction and graphic novels. More information on his website www.poltusworld.com. His novels are what he calls ‘musical novels’ – they are accompanied by songs, which can be downloaded from his website. In 2014, he won a prestigious French songwriting competition: Chanson Sans Frontière. You can read a humorous account of it on his blog. Also in 2014, he was Cartoonist in Residence at Alliance Française de Lyon, as a part of the festival of comics in Lyon (Lyon BD Festival).Read about it here.